Whoops. Joe Root loses contact with his bat. JOE Root had just hit a boundary to bring up his second consecutive hundred. 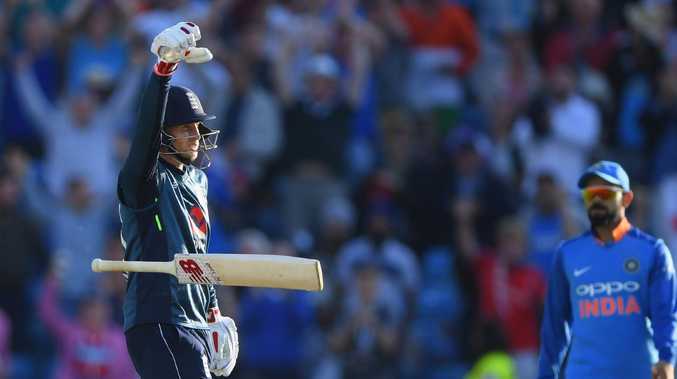 His score at Headingley earlier this week made him England's greatest ever one-day international century-maker and more importantly sealed a 2-1 series win for the hosts over India. According to Root himself, what he did next was the "most embarrassing thing" he'd ever done on a cricket field. Channelling his inner Grant Elliott, he "dropped the mic". Holding his bat parallel to the ground above shoulder height, the 27-year-old strutted down the pitch before dropping his piece of willow like a stand-up comedian in the 1990s. And he instantly knew he'd made a mistake. What Joe Root wishes he’d done after scoring his 13th ODI century. "It was something that I immediately regretted," he said. "I've not heard the end of it. It was literally the most embarrassing thing I've done on a cricket field. I don't think it will be the last I hear of it from the group - they've been hammering me. "You'd think if you were going to do a celebration like that, you'd have smacked it 30 yards out." He had not, with the boundary that brought up his hundred a choked pull shot that contrasted the poise with which he had played the rest of his innings. "It (dropping his bat) was just an absolute car crash." Whatever the case, Root's second straight century led to him being crowned man of the series. 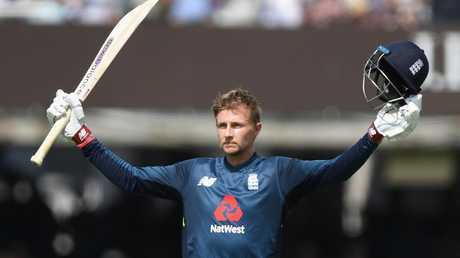 And his campaign haul of 216 runs at an average of 216 has lifted him to second on the ICC's ODI batting rankings for the first time in his career. He sits 93 ratings points behind world No.1 Virat Kohli.